ACTLAB is the Architecture Computation and Technology Laboratory of the Department of Architecture, Built Environment, and Construction Engineering at Politecnico di Milano University. Students learn how to use emerging technologies to tackle current challenges in the built environment. For his bachelor's project Topology Optimization for Structural Collapse Recovery, Davide Gamberini studied unreinforced masonry structures, common to historic buildings in Italy. With the country’s reputation as one of the most earthquake prone regions in Europe, his research answered the need to develop improved retrofitting strategies for preserving an important part of Italy’s cultural patrimony. To analyze the structure of a hypothetical unreinforced masonry building, Davide turned to Inspire. He had learned about Inspire while taking a course on cutting-edge tools and strategies in architectural design with Professor Ingrid Paoletti. Davide had always been fascinated by the synergy between structural engineering and architectural design. He was confident Inspire would provide a simple, fast solution to finding the structural improvements needed to enhance the building’s seismic performance. The building had already experienced an earthquake, which had caused seismic damage between the two upper windows. He would simulate out-of-plane loading with supports at horizontal curbs. Again, the building had already experienced an earthquake, which had caused seismic damage between the two upper windows. He would simulate out-of-plane loading with supports at the foundation. The building had never experienced an earthquake. He would simulate in-plane loading with supports at the foundation, upper level, and roof curbs. He wanted to explore a range of structural solutions, so he ran analyses of each scenario with three different materials: premixed Ultra–High Performance Concrete (UHPC), steel, and Carbon Fiber-Reinforced Polymer (CFRP). Davide discovered that, no matter which material was used, the resulting stress patterns corresponded to two distinct forms. In the first scenario, a shell, parallel to the façade’s surface, emerged during bending. In the second and third scenarios, pipe-like forms materialized as a result of axial forces. The shape of these weak zones would give form to the proposed structural enhancements. He examined the results for displacement and maximum shear stress to determine which material would provide the best seismic protection; volume, surface area, and feasibility of fabrication were also considerations. In the first scenario, UHPC proved to be the best material; in the second, it was steel; in the third, CFRP. 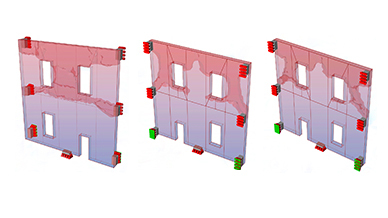 Develop an effective seismic retrofit design for a hypothetical unreinforced masonry structure. Architecture student Davide Gamberini, under the supervision of Professor Ingrid Paoletti and Professor Roberto Naboni, used Inspire to quickly and easily find the ideal shapes and materials for three design concepts. Simplified and expedited the design process. With Inspire’s guidance, Davide narrowed nine concepts down to three in just a few days. Increased the architecture student’s sense of empowerment. Thanks to Inspire’s user-friendly interface and workflow, Davide didn’t need advanced knowledge of structural engineering to perform sophisticated structural analyses and topological optimizations. 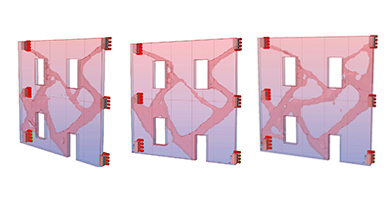 With Inspire, Davide quickly and easily found three promising concepts for his seismic retrofit design. The student plans to finalize the design with the help of Altair’s OptiStruct, a structural analysis and optimization tool for more advanced users. He will also research other construction materials to ensure a feasible fabrication process. Finally, Davide will develop an algorithmic workflow to interpret the analysis results into a constructable retrofit structure. Davide thinks Inspire could play a role in improving retrofitting strategies. It lets users explore many design options to find the best solution with relative ease and efficiency. Its ability to minimize material can also help architects design less intrusive structural enhancements. Maintaining the aesthetic and integrity of the original structure is valuable to any seismic retrofit project, especially historic buildings of cultural significance. Perpendicular loads applied in between the holes. Bond beams are used as anchor points.Perpendicular loads applied in between the holes. Bond beams are used as anchor points. Longitudinal loads applied in between the holes. Bond beams are used as anchor points. The Architecture Computation and Technology Laboratory (ACTLAB) of the Department of Architecture, Built Environment, and Construction Engineering (Department ABC) at Politecnico di Milano University explores the multiple intersections between architectural practice and computation-based tools, emergent technologies, and material science. Working across different scales, ACTLAB seeks to redefine the concepts of space, technology, and fabrication within the design and construction process. Its goal is to develop high-level research and education in the playground of contemporaneity while exploring future scenarios and emerging design areas.